Well, why do you need an autoloader anyway. You’re doing fine with require_once and include_once in your class files, right? For one, each require_once or include_once call causes the PHP engine to check if, well, the requested file has already been loaded. This is a small performance hit. More importantly, keeping track the classes you need to use is tedious and error prone. Why not offload this task to PHP and have it find the right files based on the classes you use and extend? Down the road, this could also help in introducing a Dependency Injection Container and facilitate writing smaller, less-tightly-coupled classes. PHP twitter hivemind: anyone know of a script to look in an application, show all the classes mapped to file paths? 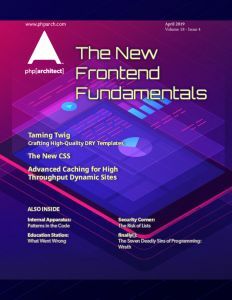 In this post, I’ll detail the three solutions I found: using Composer’s classmap autoloader, Symfony classmap generator (deprecated), or Zend Framework’s ClassFileLocator. 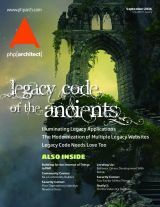 Check out the September 2016 issue of the magazine for more, practical advice to modernize your legacy application. If you want a drop-in, no hassles solution this is it, suggested by @crocodile2u. Unless you have very specific needs, I’d recommend you use it. You may already be aware that Composer provides a PSR-4 autoloader. Digging into the documentation linked by Victor, I learned how to make a classmap autoloader with Composer. You can configure it to look in one or more directories and it will scan for .php, .inc, and .hh files. It will add any classes, interfaces, and traits it finds to the classmap. You can configure it to exclude specific files or directories too. Then generate it with the following command. If Composer runs into any issues, like classes in different files with the same name, you’ll get a warning. Building the classmap array is more work than with using Composer. However, if you need to plug this into a custom autoloader this component is useful. Of course, you need to to implement any filtering or exclusion for directories and files on your own. Below is a quick script I wrote to mimic what Composer did earlier. If you’re code has similarly named classes, or other oddities, you’ll have to account for that on your own too. This outputs the map in a way you can include as PHP code—or copy and paste it. A third option, pointed out by @mwop, the Zend Framwork Project Lead, is to use ZF’s ClassFileLocator class from the zend-file component. It looks for files ending in .php and will find classes, abstract classes, interfaces, and traits. zend-file has a ClassFileLocator that can do this, and we used to have a script that used it to create class maps. Usages is slightly different than Symfony’s component. From what I could tell you have to iterate through things instead of getting the entire array at once. But the end result is the same. Now you can easily add an autoloader to your own legacy code base without much hassle. When I first posed this question, I was afraid I might have to write something from scratch, which wouldn’t be super difficult. Luckily, helpful responses and some searches showed it was a solved problem. Furhtermore, if you dig into the source for these components you’ll see there are edge cases you wouldn’t consider at first, like looking for traits if your code predates PHP 5.4. If you need to add an autoloader to your application, you can see it’s not as difficult as you might think.